Work under way this morning to remove the tyres from Trench T.
The first day back on site is generally characterised by a mix of excitement and heavy manual labour. On the second day, it’s just the heavy labour. And the same operation in Trench J earlier. There are still tyres and sandbags to move, not to mention covers that must be carefully extracted from the trenches and stored away for eight-weeks. Today, all this took place in glorious sunshine and – a very rare occurrence for Orkney – not a breath of wind. This meant that the team were working in temperatures of around 26 deg c (I’m told by my car). While they were not plagued by the wind, its absence meant the plague came in the form of flies, who buzzed and flew into sweat-and-grime-covered faces with an irritating regularity. And as I learned upon getting home, the flies managed to ruin over 50 per cent of today’s photographs by clustering all over the camera lens just as the shutter clicked. But we soldiered on and a record tumbled at the Ness – the entire site was uncovered by 1pm and the dig team working in the trenches cleaning up the detritus of a winter under wraps. I say tumbled but director Nick pointed out that the existing record saw the diggers in the trenches by 11.30am on day two. They, however, did not have Trench J to contend with, so all of us involved in this morning’s work are claiming the title! But hats off to all involved in the past two day’s work – citing their sterling performance, Nick is delighted by the progress made in this, the less than glamourous side of excavation. With the covers off, the team was set to work on doing an initial overall clean of the trenches, removing weeds from sections and generally sprucing the site up for our first official public tours tomorrow. Despite the fact that we are only on our second day, already the splendour of the site’s buildings is beginning again to show itself as wallheads are cleaned and surfaces brought back to life with a brisk trowelling. With the site uncovered, the archaeology can begin in earnest. A new trench is planned — Trench Y — to see whether we can find evidence of the southern section of the boundary wall that once enclosed the site. The four-metre-thick western section of this wall was unearthed in 2007 and the subsequent discovery of a second wall — to the south-east of the site — suggested the complex was completely enclosed. In 2016, a trench was extended towards the Stenness Loch to look for evidence that the wall sections were once connected. Unfortunately, nothing was found. Drone photo showing the suspected location (solid line) of the southern boundary wall. In 2017, however, close examination of an aerial photograph revealed faint, but definite, marks on the landscape. Not only did these clearly show the location of the two known wall sections but highlighted the layout of the enclosing side walls. The difference was that the wall running along the side of the loch was closer to the water than originally thought. We found no upstanding traces of the connecting wall because we had been digging in the wrong place. We had tried geophysics on the Stenness Loch side, but overhead power lines and a fence line scrambled the results. So, with no scans to work with, the trench had to be extended based on our suspicions and did take it far enough towards the water. Trench Y will look for evidence of the wall as it swings around and along the shore of the loch. Watch this space for updates. Trench J. The ‘Great Wall’ is shown in red, with Structure Five in yellow. Trench J — a trench containing a corner of the ”Great Wall” — and the adjacent building, Structure Five — was re-opened in 2017 for the first time since 2008. Nick suspected that Structure Five was an Early Neolithic building and this proved correct. The building is very reminiscent of the early house at the Knap of Howar (3600BC), in Papa Westray. 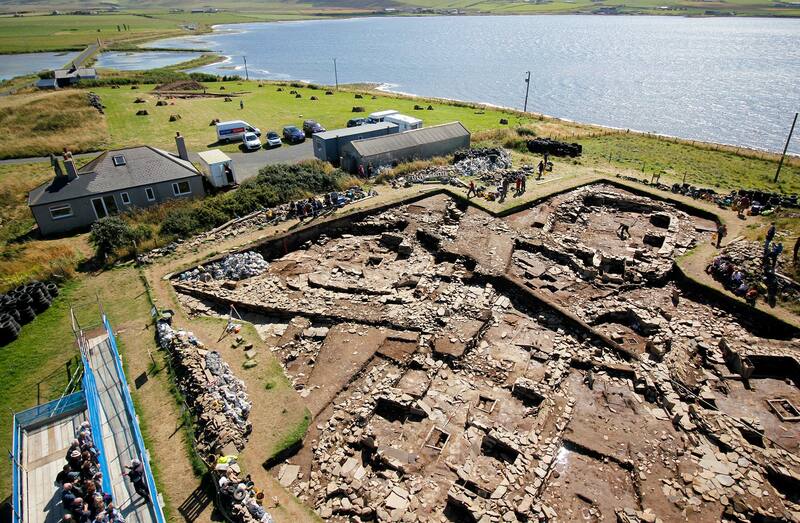 But in true Ness of Brodgar fashion is much bigger. It also became clear that the “Great Wall” not only curved to follow a path along the shore of the Harray Loch, but curled closely around Structure Five — suggesting that it, too, was a very early element in the history of the site. This was confirmed by excavation, which showed nothing lay beneath the wall section except the natural boulder clay on which it stood. Trench J will be extended this season to, hopefully, uncover the full circuit of this early structure. Trench T — to the south-east of the main site — proved particularly obstinate in 2017. Work to excavate the huge midden mound began in 2013. At first it was thought to be nothing more than a “monumental pile of rubbish” — a visible example of conspicuous consumption and a reflection of the status and affluence of the Ness left for all to see. Structure Twenty-Seven – schematic of construction. In 2014, however, the stump of a standing stone turned up at the foot of the mound, suggesting there might be more to it. In 2015, wall sections and orthostats were found at the bottom of the trench, followed, in 2016, by massive stone slabs in the remains of a puzzling structure. We felt these structural remnants represented a chambered cairn, similar to the one site director Nick Card had excavated at Bookan, at the other end of the Ness, in 2002. But, as the weeks passed, the sheer scale of the building — Structure Twenty-Seven — became clearer. The building was huge and the stone slabs so big that it was suggested they were re-purposed standing stones. These massive megaliths were used to support orthostats that clad the structure’s less-than-perfect interior wall face. Given its position, it Structure Twenty-Seven is also likely to pre-date many of the other buildings on site. Describing the trench as a “source of frustration and delight”, Nick had hoped to reveal more of Structure Twenty-Seven last year, but progress was slowed by the discovery of pits and fragments of walling. More of the building’s south end was uncovered last year and there were also hints of what might be its entrance. We had thought that Structure Twenty-Seven had been substantially dismantled in the Neolithic — its stone plundered for use elsewhere and that not much of it had survived. But we found another section of nicely built drain, that may have been underneath a flagged passageway around the exterior of the building — somewhat similar to that around Structure Ten in the main trench. In addition, more of the building’s 2.3-metre-thick back wall was uncovered and found to be in a better state of repair, with several courses surviving. Excavation work this summer will, hopefully, bring us a clear idea of the layout of this puzzling building. So, there’s all that to look forward to and hopefully more. As ever, keep an eye on the daily diary for updates and information on what turns up each day.